We invite article submissions from scholars working on developments in Ukrainian economics, history, international relations, law, politics, public policy and sociology. All methods and approaches will be considered. Manuscripts should not have been previously published. We will give preference to articles that present findings from original research. Krytyka reserves all rights to the material it publishes. Journal of Ukrainian Politics and Society (JUPS) is an open-access peer-reviewed journal published bi-annually online. The process of review and publication takes about six months or less; however, it may take longer if authors are asked to substantially revise their submission. We will primarily accept articles in English and encourage authors to have their articles translated and edited before submitting. However, articles in other European languages of an exceptional quality will be accepted for translation, peer-review and publication. Authors should limit their manuscripts to 8,000-10,000 words (including footnotes), although occasionally we will consider longer articles of an exceptional quality. Please remove your name or any references in the manuscript that might identify you. Include an abstract (100-150 words) on the first page of your manuscript. In a separate cover letter, please provide your name, short bio, affiliation and contact information. Please use Harvard style referencing (detailed below) and BGN/PCGN/UN transliteration or Romanization system. We do no allow simultaneous submissions. 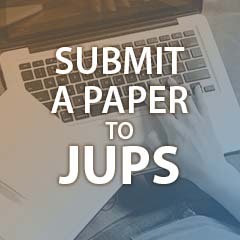 The goal of JUPS is to publish new research, set in the context of cumulative scholarship on a given subject. In light of this, the introductory section of the paper should clearly set out the puzzle and research question(s) that the author addresses, how the argument builds on or revises existing knowledge on the subject, why the issue under examination matters, and generally what is new about the argument put forth (its approach, sources, methodology, etc). Early in the paper, some discussion of the previous important work or the literature review on the subject should take place. The journal uses American English spelling (such as in "defense," "color," "privatization") and punctuation, but British spelling should be maintained when used in direct quotes. The authors should be listed in alphabetical order. If any similar qualitative research is to be undertaken in the future, then stringent controls should be put in place to ensure such statistical anomalies do not occur through lack of methodological rigor, particularly through corruption of data inadequately stored and processes (Mullane 2006, p.66). The actual quote is in slightly smaller font and indented from the left-hand margin to distinguish it from the surrounding text; no quotation marks are included in block quotes. At the end of the article, the author should provide a list of references. Please use the PDF Style Guide for guidance.